A recently completed assignment involved both the EI Engineering team and our Construction Division in designing and constructing a transfer station for an extremely toxic material. The facility prepares for shipment and transfers liquefied anhydrous HCL from rail tank cars to tank trucks and small “pigs” (the name for small transfer tanks). The material is stored and transported at - 40 to keep it in a liquid state. During the design phase, a complete site plan was prepared, detailing the clearing and preparation of the undeveloped location. 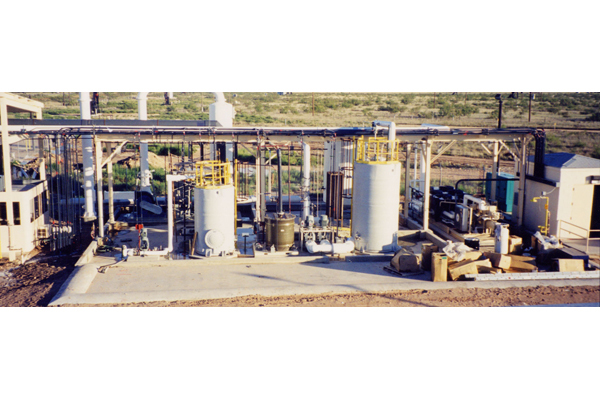 The facility consists of a large loading/ unloading dock with transfer pumps and piping with a scrubber system for escaped gas, a pump building, a containment dike, and an office building. Since the location was completely undeveloped, a well had to be drilled and a 65,000 gallon water storage tank built to supply a spray system for the loading/unloading area in the event of a spill.